BALTIMORE, MD. 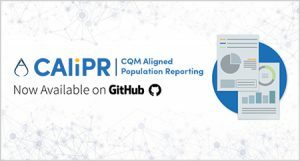 October 27, 2016 — Audacious Inquiry (Ai), a health information technology and policy company, announced today that the CQM Aligned Population Reporting (CAliPR®) code is now available via GitHub. As open-source technology, providers, organizations, and states who are interested in utilizing CAliPR can now download the source code free of charge. Ai will remain the steward of the open source project as it continues to actively contribute product enhancements. CAliPR is designed to calculate electronic clinical quality measures (eCQMs) at a provider, practice, payment arrangement, and community level to support incentive and value-based payment programs. This is achieved by leveraging clinical summaries formatted to an industry standard, while integrating CAliPR with a master data management solution. Using the momentum from federal and state governments to promote and adopt open-source technology, Ai has worked in conjunction with Maryland’s state designated health information exchange, Chesapeake Regional Information System for our Patients (CRISP), and the Department of Health and Mental Hygiene (DHMH) to expand from the popHealth open-sourced code to develop CAliPR. “Implemented as a quality reporting tool within a community-wide Health Information Exchange (HIE), CAliPR has the potential to redefine how we measure quality. We no longer have to measure quality by looking solely at the provider or insurer through latent claims data; but instead, we can focus on how all healthcare encounters impact patient outcomes,” said Paul Messino, Chief of Health Information Technology Policy for DHMH. As the healthcare industry continues to evolve, the move from the traditional fee-for-service model to value-based programs will necessitate an evolving health IT infrastructure. CAliPR was designed to be adaptable to the coming healthcare transformation, supporting both current and future program requirements. “Ai has been privileged to work with CRISP and DHMH to leverage not only our technology expertise, but also our health IT policy knowledge to build a tool that will help clinicians improve the quality of care they provide to patients. We’re looking forward to supporting clinicians both in the Medicaid EHR Incentive program as well as the Quality Payment Program and believe that CAliPR is well positioned to help clinicians achieve more holistic CQM results that take into account care provided across the entire community, not just in a single practice,” said Genevieve Morris, Sr. Director of Health IT Policy at Ai. On December 21, 2015 CAliPR v1.0.0 achieved Office of the National Coordinator for Health IT (ONC) 2014 Edition modular EHR certification through ICSA Labs, an ONC-Authorized Certification Body (ONC-ACB). For more information, click here. To learn more about CAliPR, or if you are interested in leveraging Ai’s expertise to help deploy the tool, contact Marc Falcone at mfalcone@ainq.com. Audacious Inquiry (Ai) is a health information technology and policy company that provides bold solutions for connected healthcare. Ai’s industry-shaping technology offers efficient and cost-effective solutions for care coordination; their nationally-recognized team-members provide tactful strategic consulting, and their services rethink how health information is shared, managed, leveraged, and protected.